The Tracer Air Overshirt is just the thing for hot summer use. Its full mesh all over, so the air blows right through. For a look at its non-mesh brother, the Tracer 2, take the link below. From a distance, the Tracer air just looks like a standard textile jacket. Only when you get close can you tell the material is mesh. It is a dense weave and feels sturdy and its surprisingly heavy duty too. I don’t know first hand, but I’d bet this material would outperform the cotton/poly blend material in the standard shirt. Unfortunately, I don’t have the striped jackets in front of me so I won’t comment on those, but I do like the black. The weight and sturdiness of the material means this jacket hangs well without wrinkling and puckering which I like. The pockets and collar are trimmed in a slick black nylon material which gives the shirt sort of a “formal” look. The inside of the shirt is lined with a camo-print nylon. The shirt closes with a zipper (for safety) and then there is a snap closure setup for the placket over the zipper. The snaps look like buttons to give the shirt a more sturdy appearance (think lumberjacket shirt or Levi jacket perhaps). The last couple snaps don’t have the button look on the outside which the paint on your tank will be thankful for. The rubberized patch on the shoulder with REVIT’s logo Velcros in place, so if you want to replace that with your own patch, you’ll be able to do that easily without sewing. The collar tips have small snaps to hold them down so they don’t flap and drive you crazy at higher speeds. 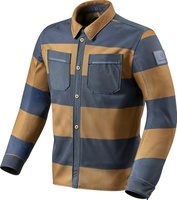 REVIT says: The Tracer Air takes on the role of a mesh jacket but in overshirt form. The full PWR|mesh outer shell allows for optimal airflow, cooling down the body on those hot summer rides. Extensive development led the PWR|mesh to look like streetwear fashion material, so when you take a closer look, the open structure to allow all the air to flow through is visible. Further protection comes at the shoulders and elbows thanks to the SEESMART™ CE-level 1 armor. For additional protection, you can upgrade the Tracer Air with our SEESOFT™ CE-level 2 back protector insert.